A Bedazzled [kind of] Life: 95. The Gift of...Giving? We've all been there...facing our checkbooks, deciding how much to give the person's whose wedding you are about to go. You factor a million things and somehow still feel cheap...or feel like it's to much. But the truth is, choosing the dollar amount to give or picking up a gift off the registry is nerve racking. How long have you known this person? How much did they give us (if you are already married)? Was the shower gift to expensive? Are we spending a trillion dollars in travel expenses? And most importantly, how can I give this couple more when I have 7 other weddings to go? And you thought just being a guest was easy? As much as a guest will sit there and your food and decor, the couple who invited you, will sit and there and take a look at the gift you gave them. What do you want your gift to say about you? Like I said, there are many factors into giving a wedding gift. Because money can be such a personal thing to most people, I will offer myself and my husband's financial opinions when it comes to weddings. Between May 2009 and August 2010, Jason & I attended 10 weddings, including our own and having been in two. I calculated the approximate total of the money we spent (not on our wedding) on bridal shower gifts, bachelor/bachelorette parties, outfits, hotel rooms and the wedding gift itself up and honey, I hope you're aren't reading this...but we spent close to $3,00. By the end of 2011 - we will have done 5 more with 3 for 2012, and one in the books for 2013. CRAZY. Let that sink in. 3 grand. That's a down payment on a new car, an all-inclusive vacation to Mexico or a Chanel bag. What? I like Chanel. I'm so thankful that we are in the position that we can still give our friends a nice gift, but what about those who aren't? Let's first focus on the gift for the reception - which is truly the gift that will weigh the most of your mind. The typical amount to go with (or start at) is $75 per guest, and if you bring a date then expect to double that amount. My dad yammered on during the planning of my wedding that the cost per head when my sister got married in 1995 was $55.50/person. Let me just say that price does NOT exist anymore so if you want to try and cover your plate $75 is the right price to start at. If you are attending a wedding where there will be a social group of friends/family members and you feel comfortable asking what they will give, what does it hurt? 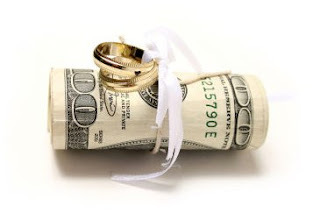 I noticed at our wedding circles of friends all gave around the same amount, and why shouldn't they? It's a good thing. So starting with $75 here are a few more guidelines for higher amounts and different relationships that exist. If it's a co-worker's wedding, you should spend $75 to $100; a relative or friend, $100-$125; and if it's a close friend or close relative, anywhere from $100 to $150 or more is acceptable. A wedding does not start or end with a reception gift. You have to be sure to factor in ALL events surrounding the wedding itself including transportation. If you attend the shower, bachelorette party and have to drive an hour each way for the wedding...I highly doubt the bride/groom will be expecting a $3-400 check. In order for you to get a better picture of it all - here are a few rules to follow. Don't extend yourself beyond your means. If all you can afford is a gift and your presence...than that's all you should do. A wedding is a joyous event, not one to make you go bankrupt. Don't be afraid to ask others that you know are going what they are spending. If you still can't make it to the festivities - it is always polite to send a gift in your place! Couples put the time and effort into creating a wedding registry - there's little risk involved when choosing a gift from it. While there are the rare with the gift of off the registry purchasing (read here) - it's probably best to just choose from the registry. 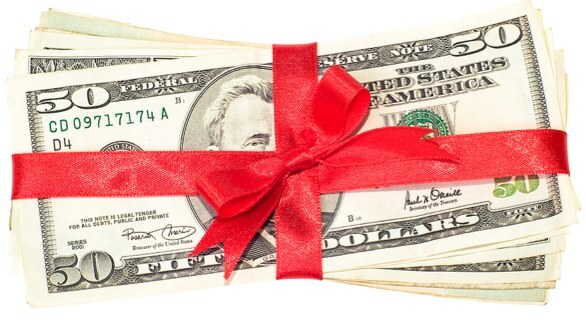 Whether you’re gifting cash or presents, the exact formula of how much you should spend depends on many factors: your finances; conventions in your family and social circle; how well you know the couple; and whether you’ll be spending a lot of money on transportation and lodging, etc. Step 1: Come up with a total expenditure that feels right to you. Be sure to consider all the events: the showers, engagement parties, and the wedding itself. Generally speaking, the closer you are to the couple, the more you should gift. If you’re traveling great distances to attend the celebration (and are thus spending a lot of money in transit) then you may be expected to gift a little less. Step 2: Portion out your total sum by event. Once you’ve figured out what you want to spend on the couple’s gifts overall, you can break it down by percentages so that the wedding gift gets the bulk of your cash. That means if you're spending $250 total, you’d spend $50 each on the engagement and shower, and $150 on the wedding present. First, $75 to cover your plate? I wish! Second, thoughts on checks versus gifts? It always seems like if you give a check you have to give more than if you give a gift. Third, I think a great idea for people strapped for cash is to go in with others on a nice gift. The larger gifts on a registry are less likely to get purchased. But it may actually be more affordable for a group to get a large gift than purchasing one small gift all by yourself. And what couple doesn't want a nice set of pots and pans or knives or suitcases? Fourth, brides and grooms really should remember to update their registries as time goes along. If everything is purchased after your shower please update it before your wedding. Otherwise you may end up with three blenders since no one knew what to get you. I know $75 is "nice to think of" but like I said - I think it's the best price point to start with. I know most price per head is more around $115-130 but most people probably can't afford to give the couple a $200+ check LOL and $75 per person is better than $50! I think it's a low enough # that you - the couple - will be okay getting and you - the guest - can be okay giving or at least use as a starting point. 4th - 100% agree. The couple that doesn't update their registry or at least check that there are things that people can still purchase they are sending a blatant message that "we want cash" - which is rude. 5th - I love that web site as well - but sometimes I think they are a little off base.